What do you have planned for the weekend? Any fun Halloween activities? My weekend is going to be pretty busy, but not with Halloween things. We have plans to celebrate my dads birthday on Friday evening with dinner out and on Saturday we are headed to Kitchen Kettle Village in Lancaster. I love visiting the antique shops, specialty food stores and cafes! They have a little bit of everything. Now, we just need beautiful fall weather on Saturday! Today I'm sharing this gorgeous mixed media lantern blouse from LOFT. I saw this top in stores and it was true love! My last post was all about my obsession with deep red colors, so you all know the color was a huge selling point! The unique part about this blouse is the lantern sleeves. They are so girly and fun! I also really like the split neck. I'm wearing a black lace cami underneath. This top is $44.50 at full price but LOFT always runs sales so keep an eye out to get 40-50% off. 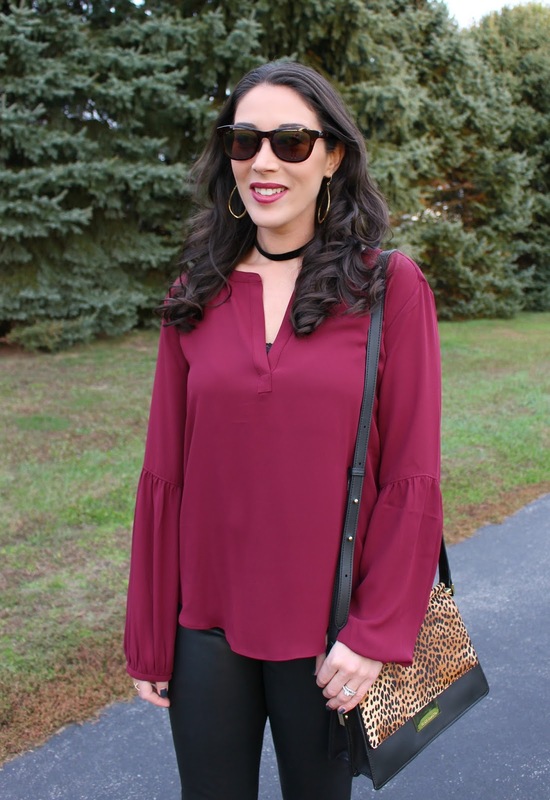 For a feminine meets edgy vibe, I wore my LOFT faux leather ponte leggings. Ponte leggings are thicker than regular leggings which I really love. Thin leggings are definitely a no if you aren't wearing a dress or tunic shirt. Since this top isn't very long, ponte leggings or a thicker pant/jean are a better option. I highly recommend these leggings...they are so sleek and comfy! I also like how they are faux leather in the front and regular ponte pant in the back. I'm finally jumping on the choker necklace trend! 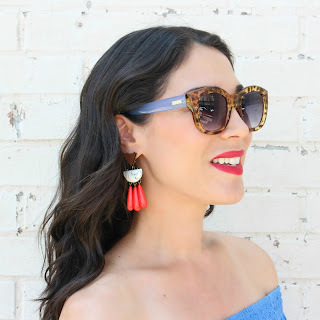 I've been shopping around for one I like at a good price, and I found it at Nordstrom! The BP. Velvet Choker is simple but chic. The velvet material is very pretty and it has an adjustable gold clasp in the back. At only $14, it's perfect! It comes in other colors too (I love the burgundy)! A simple black choker looks great alone but will also be pretty layered with longer necklaces. My Vince Camuto leopard bag is from Nordstrom, but unfortunately it is sold out. This bag was SO popular and went really fast! I guess they aren't restocking it, but I'll be sure to let you all know if they do! For a similar bag, I love this Sole Society crossbody. These Halogen studded pumps instantly glam up this outfit and add more edginess to the look. I bought these pumps last winter at Nordstrom and I love how unique they are. They are long gone now but the Sole Society 'Anneke' Pump is similar and gets great reviews for comfort! The prefect fall outfit! Those leggings look great on you and I definitely agree on ponte leggings. And don't get me started on those heels!! I seriously need these leggings in my life. They look so great with your burgundy blouse and the pop of leopard! Thanks for linking up with Fabulous Friday, Tamara.